MainAll NewsTechnology & HealthOnly in Israel - An App for Your Pet Dog! Only in Israel - An App for Your Pet Dog! Meet the Tel Aviv start-up looking to make it big in one of the world's most dog-friendly - and dog-crazy - cities. Anyone who has spent any amount of time in Tel Aviv knows that Israel's "Silicon Wadi" is dog-crazy. Tel Aviv has around 80,000 dogs with over 60 dog parks - making it one of the most dog-friendly cities in the world. Unsurprisingly, it hasn't taken the start-up nation very long to come up with an app to help urban dog owners manage all aspects of their dog's life. DOGIZ is a new exciting Israeli start-up for dog owners. It's a free app enabling dog owners to see in real time which dogs are playing in which of Tel Aviv's numerous dog parks, as well as providing users with a comprehensive and interactive guide to all essential doggie services like vets, pet stores, dog-walkers, dog-sitters and more. DOGIZ launched its beta seven week ago and already has several thousand users on Android and IOS, and Arutz Sheva met up with some Tel Aviv dog owners to find out more about the stresses of owning a dog in this crazy city, and how the new app has effected them. Shmuel Leibtag, 26, is an Oleh Chadash from the USA and lives with Jax, a 16-month-old Ridgeback/Pitbull mix, in the heart of Tel Aviv. "As a dog owner it can be extremely difficult to keep track of all my dog's needs, whether that be ensuring he has had enough exercise, taking him to the vet, or even just remembering to put on Jax's flea medication," he explained. Shmuel now works for Taglit (Birthright) as a recruitment manager and tries to go to the dog park once or twice a day to ensure Jax can play with his friends. "Jax is a very energetic dog and needs a lot of time to run and play with the other dogs. DOGIZ allows me to see in real time which dogs are playing in the park, so I can ensure Jax has the best time possible with his friends." But it's not just Jax who's benefiting. "Through Jax I have made so many friends at the dog park, and DOGIZ is an awesome platform to stay in touch with my (and Jax's) dog park friends," he added. 26-year-old Maayan Aharonovitch lives in a small apartment in north Tel Aviv with her dog Paul. Due to Maayan's intense work schedule she uses a dog walker during the day so that Paul isn't stuck by himself - and uses her app to keep tabs on him. "Most dog owners in Tel Aviv live in apartments, not houses. That means that our dogs are stuck in a small apartment all day, with no back yard," Maayan notes. "When I order a dog walker through DOGIZ, I can be at work and track where he is taking Paul." But even with all the exercise, when Maayan returns home from work she is usually greeted by a restless and excited Paul. "As a dog owner I have two primary concerns, finding a variety of parks nearby and ensuring Paul enjoys plenty of interaction with other dogs. "I love the fact that DOGIZ provides me with a great solution for these two problems - there is nothing worse than showing up to the dog park and finding it empty! The fact is that every dog owner wants their dog to socialize with other dogs, and the majority of dog owners I know are constantly looking for new places to go to with their dogs." After hearing from some happy users I met with Danny Djanogly, an Oleh Chadash from London and one of the founders of DOGIZ. 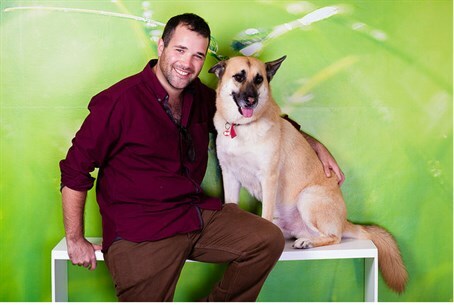 Danny lives in central Tel Aviv with his best friend Mufasa, who was in fact the inspiration behind the app. "I had never had a dog before - I learned everything I needed to about raising a dog from friendly dog owners I met at the dog park," said Danny. "Mufasa is a big German Shepherd and needs a lot of exercise each day, he is extremely sociable and there is nothing he loves more than running around the park with his friends." "We created DOGIZ to enable urban dog owners to easily connect with their local canine community as well ensuring they can access essential dog services on demand." DOGIZ has made impressive progress since its launch only eight weeks ago. The app already has over 50 Dog Walkers and 100 dog sitters registered - and Danny assured me that there are some exciting new affiliations in the pipeline which will further expand the range of doggie essentials on offer. His vision, he says, is to help urban dog owners manage all aspects of their dog's life on the go, directly from their smartphone. And while Danny's now thinking big - with plans already in the pipeline to go international - he stresses that the app's primary motivation was initially something much more basic. Dog owners often identify and act as a community, he explained, so for him "DOGIZ is all about giving back to the community we love."